Nine out of ten Americans believe there will be more racial disturbances this summer, and half think they will hit close to home, new polls say. Black and white Americans have a drastically different view of what is driving the violence. 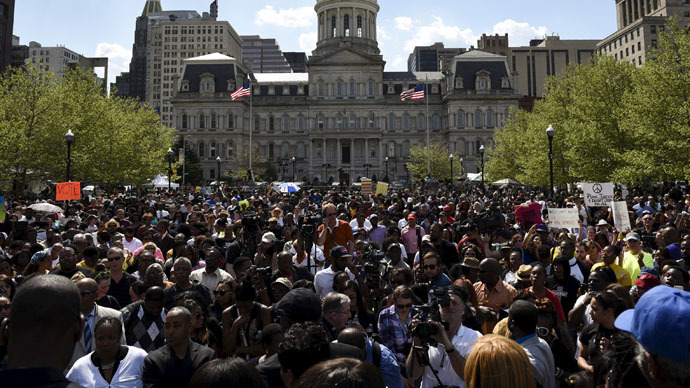 An overwhelming 96 percent believe unrest akin to what recently happened in Baltimore is likely this summer, a Wall Street Journal/NBC News poll released Monday reveals. Some 46 percent of African Americans polled are less likely to think violence would happen in a city close to them, compared to 53 percent of white respondents. Among the white respondents the proportion was almost entirely reversed, with 58 percent believing it was people using an excuse to loot, and only 32 percent blaming the long-standing frustrations with police. Conducted from April 28-30 on a sample of 508 adults, 111 of which were African-Americans, the WSJ/NBC poll asked questions about Baltimore and racial disturbances. The margin of error was plus-or-minus 4.35 percentage points overall, and higher for sub-groups, the pollsters noted. An overwhelming majority of African-Americans, 69 percent, believe the government only pays attention to black problems “when blacks resort to violent demonstrations or riots,” while only 15 percent disagree, a survey conducted in the same timespan by the UK-based pollsters YouGov indicates. By contrast, only 37 percent of white respondents thought the government only paid attention to violence during times of violent unrest, while 47 percent disagreed. The poll also found white respondents almost evenly split on whether the death of Baltimore resident Freddie Gray while in police custody was an isolated incident (36 percent) or part of a broader pattern (38 percent). In a January poll, 56 percent of whites believed Michael Brown’s death in Ferguson, Missouri was an isolated incident, and 31 percent saw a pattern.